Posted under Health Guides. Updated 27 December 2018. Legumes are a great source of protein, carbohydrates, and fiber. Foods such as beans and lentils are known as legumes. Legumes are good sources of protein and fiber, and are used in many different cuisines. In the US, you can find fresh, canned, frozen, or dried versions of many legumes. What are some common legumes? Black beans are medium-sized, oval beans with black skin. They have a slightly sweet flavor and are often used in soups, or served with rice. They are included in many Mexican and Latin American dishes and can be used in soups, stews, and rice dishes. Black-eyed peas are medium-sized, oval beans that are cream colored with a black dot. They have a sharp flavor and smooth texture. They are usually served with rice or eaten as a side dish. Garbanzo beans, also called chickpeas, are medium-sized, round beans that are beige in color. They have a nutty flavor and firm texture. Garbanzo beans are used in soups, salads, Indian dishes, and popular Middle Eastern and Mediterranean dishes such as hummus and falafel. Green peas are small-sized and round, with a sweet and starchy taste. Green peas are often used in pasta dishes, soups, and salads. Kidney beans, also called Mexican red beans, are large and kidney-shaped with a strong flavor and soft texture. Kidney beans are used in soups, salads, chili, Creole dishes, and traditional rice and beans. Lentils are circular-shaped seeds. 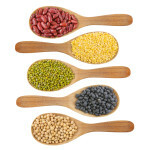 There are five types of lentils, black, brown, red, green, and yellow. Lentils are often used in Indian dishes, side dishes, soups, and stews. Lima beans are flat, green or cream in color, with a starchy, potato-like taste. They can be used in casseroles, soups, and salads. Navy beans are small, white, oval beans with a mild flavor and powdery texture. They are often used to make soups, and stews. Peanuts, while commonly thought of as a nut, are actually part of the legume family. They are medium-sized and oval-shaped, with a nutty taste. Pinto beans are medium-sized, oval beans with a spotty beige and brown color. They turn completely brown when cooked and are used to make refried beans and other Mexican bean dishes. What are some ways to prepare and eat legumes? To cook dried legumes (that you purchase in bulk bags), you must first rehydrate or soak them. Add 1 cup of dry beans and 5 cups of water to a covered bowl and soak overnight. For faster preparation, add 1 cup of dry beans to 5 cups of hot water and heat to a boil. Boil for 2-3 minutes and then remove from heat. Let the beans sit covered for at least 1 hour. After your beans have been soaked, drain the water. Add new water to the pot and boil beans. Bring beans to a boil and simmer until they become tender; this will take about 30-45 minutes. Drain water again before serving. This process of soaking, draining, and boiling will get rid of some carbohydrates in the beans that we cannot digest and typically cause us to have gas. Canned beans are already cooked. Just drain and rinse them before serving. You can also warm them up for a few minutes in a pan with water, spices, or a sauce. Try topping your salads with canned or cooked beans to add protein. Hummus, made from garbanzo beans, is great on sandwiches or wraps and makes an excellent dip for veggies. See recipe below. Make your own dip by mixing beans, salsa, and cheese in a dish. Microwave the mixture until the cheese is melted. Blend until creamy and serve with sliced veggies, pita chips, or on a wrap. Keep refrigerated. Whisk dressing ingredients together and set aside. Adjust taste as needed. Put the beans in a large salad bowl. Add the rest of the ingredients and toss with dressing. If saving for later, keep salad well covered in refrigerator. Add pepper and onion and cook, stirring often, for 3-4 minutes. Add the dried spices and beans and cook, stirring, until beans are heated through. When the beans are heated thoroughly, add the Tabasco sauce. Serve over warm rice.